It’s a bug in some versions of the OpenSSL software that handles security for a lot of large websites. In a nutshell, a weakness in one feature of the software — the so called “heartbeat” extension, which allows services to keep a secure connection open over an extended period of time — allows hackers to read and capture data that is stored in the memory of the system. It was discovered independently by a security company called Codenomicon and a Google researcher named Neel Mehta, both of whom have helped co-ordinate the response. As cryptographer and Johns Hopkins professor Matthew Green describes it, the problem is “a tiny vulnerability — a simple missing bounds check — in the code that handles TLS ‘heartbeat’ messages. By abusing this mechanism, an attacker can request that a running TLS server hand over a relatively large slice (up to 64KB) of its private memory space” (if you’re interested, Green has more technical info about the details of the bug and potential hazards at his site). According to a report in the Guardian, “among the systems confirmed to be affected are Imgur, OKCupid, Eventbrite, and the FBI’s website, all of which run affected versions of OpenSSL. Attacks using the vulnerability are already in the wild: one lets a hacker look at the cookies of the last person to visit an affected server, revealing personal information.” Amazon told The Register that it has dealt with some of the parts of its infrastructure that were vulnerable but still has work to do. 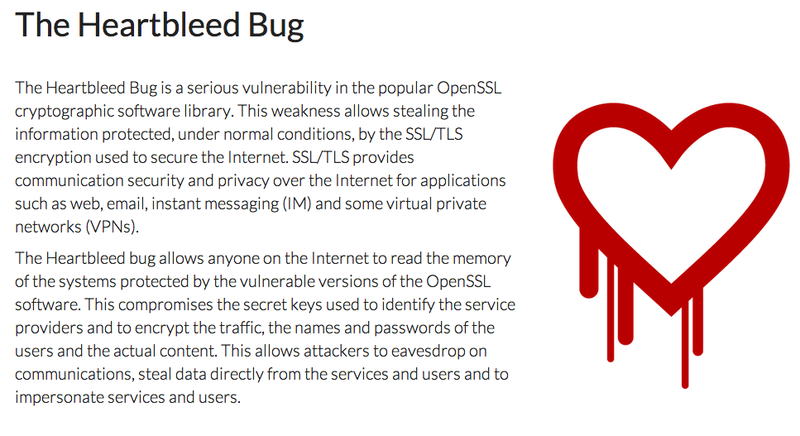 Codenomicon’s Heartbleed site says the company tested some of its own services from outside, as though it was an attacker, and found that “without using any privileged information or credentials we were able steal from ourselves the secret keys used for our X.509 certificates, user names and passwords, instant messages, emails and business critical documents and communication.” Google (s goog) was reportedly unaffected, as were Twitter (s twtr) and Facebook (s fb). If you are a web user, the short answer is not much. You can check the list of sites affected on Github, or you could try a tool from developer Filippo Valsorda that checks sites to see if they are still vulnerable (although false positives have been reported), and you should probably change your passwords for those sites if you find any you use regularly. As mentioned by commenter Philip Tellis below, you could also check this SSL tool from SSL Labs, which will give you a report on each server behind a specific DNS address. And users should make sure that their browser checks to see if a security certificate has been revoked before connecting — Chrome has this disabled by default but it can be turned on in the settings. If you are a network administrator or website manager, then you should already be applying the patch and/or recompiling your version of OpenSSL to remove the vulnerability — and you should also be reissuing your SSL security certificates and getting users to create new passwords. The problem is that doing all of this on every server and for every user and service is going to take some time. Was Heartbleed outed by Edward Snowden? Is there a test site (trusted!) for checking out clients, or better some Opensource server that tries just that and can whether my clients are affected? Here’s a silly question – sites like Github (and others) get hit by large DDOS attacks on a regular basis. Any bets on whether those DDOS connections were really “super clever” attackers that were using the Heartbleed vulnerability to continually harvest the “SSL protected” traffic of other users? Hey thanks, I’m just a really uninformed user of the net. This is the best article I’ve read about the problem. Thanks for the info and the links. Aside from a bit of additional info Great piece. Thanks for the heads-up frankbyers! And I totally agree with your last 3 sentences!!! Please make yourself be well aware of this Heartbleed bug. It recently tried to compromise my major nationally known bank account by creating a tab panel to come up once I was already logged into my account asking for my acct #, SSN, CVC #, birthdate, mother’s maiden name and card expiration date. If this happens to you, DO NOT fill it out. Close your session and call your bank immediately. Change your logon and password through your bank on the phone. Run a malware and anti-virus scan also. The bank would never ask for any or all of this information. Is this all people have to do with their time, is to steal from others? Identity thieves and hackers need life imprisonment. The abounding greed in this world is astounding. Nitpick: there’s no such thing as a “DNS address”. It only makes sense to change passwords for sites that were previously vulnerable but are no longer vulnerable, i.e. they’ve implemented the fix. No point in changing the password for any site that is still vulnerable, as the new password will be just as much at risk as the old one. Good point, Steve — thanks. You may want to add a link to https://www.ssllabs.com/ssltest/ which is the de-facto place to test your servers for SSL vulnerabilities. It has few advantages over Filippo’s tool, most particularly, the ability to handle more load, and the ability to give you a report on each server behind a DNS rotation. You may also want to mention that end users should make sure their browser actually checks Certificate Revocation Lists as by default Chrome has this disabled. Thanks, Philip — both good suggestions. I will do that. Another epic fail by FOSS. I mean EEEEEEEEEEEEEEEEEPIC!!! Folks, time to get off that “better than proprietary software” bandwagon or whatever laughable myth these guys are preaching. Openness does not lead to quality automatically. Quality software is done by quality people that usually demand a nice pay that only proprietary firms can afford. As simple as that. Funny how larry doesn’t comment back when faced with facts that shows areas where OpenSource is the better open option, seems he must be a fanboy of some proprietary software that’s losing it’s market to OpenSource!